Apple’s fall events are always its most exciting. They deliver our very first (official) glimpse at the new iPhone lineup, and often there are other new products to look forward to as well. This year, we’re expecting a slew of huge announcements. A refreshed iPhone X, a larger “iPhone X Plus,” and a more affordable 6.1-inch iPhone with an LCD display will be the stars of the show. Recent rumors have also suggested that we can expect Apple to hold onto the iPhone 7, which will become its cheapest handset. We have a whole guide on what we expect from the 2018 iPhone lineup, so be sure to check that out if you haven’t been keeping up with the rumors. We’re also looking forward to an Apple Watch Series 4 with a larger, edge-to-edge display and more powerful internals. Recent leaks have indicated that Apple will continue offering 38mm and 42mm options, as well as pricier models with built-in LTE connectivity. One rumor has also claimed that Apple will ditch the Watch’s moving buttons and replace them with solid-state buttons that use haptic feedback — like iPhone 8’s Home button. Fewer moving parts are always good, especially in water-resistant devices. The iPad Pro family is likely to see a Super Retina HD display, Face ID, and other significant improvements, too. We’ve also seen evidence of a mysterious new connector or sensor that will sit on the back of the new slates, right above the Lightning port. Some have suggested this will be another Smart Connector, allowing the new iPad Pro lineup to be used in portrait mode when connected to a Smart Keyboard. However, it could be something else entirely. Apple may also confirm a more affordable notebook that’s set to replace the MacBook Air. The 12-inch MacBook, iMac, and the Mac mini are also due a refresh. Before you get too excited, however, there is a possibility Apple will hold another even for Macs in October. We will also find out the official release dates of iOS 12, macOS Mojave, watchOS 5, and tvOS 12. This will be the second Apple event held in the Steve Jobs Theater inside Apple Park. 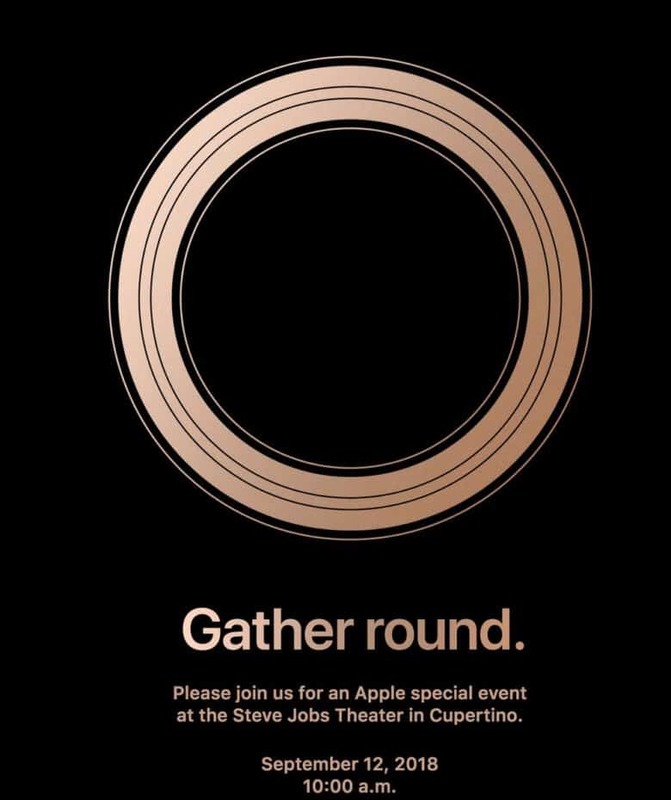 Apple’s invite focuses on that with a large circular graphic depicting its new headquarters, rather than offering any hints at what we can expect from product announcements. It’s likely that Apple’s new iPhones will be available to preorder on Friday, September 14 — just two days after the event. They should be available a week later on September 21. The same will likely be true for Apple Watch Series 4 and the new iPad Pro lineup. Some products, such as any new Macs, could be available to order soon after Apple’s keynote is over. If you’ve been itching to get your hands on any of these devices, then, you’ll want to have your credit card at the ready come September 12.